I ended up reading this one in one sitting. I was just going to start it while having a coffee at the coffeeshop and then BAM! I turned into a table hog, as I just kept turning the pages until I turned the last one. This not Rubin’s only Cybils nominee-- she also wrote the Bernstein biography Music Was It: Young Leonard Bernstein. In Wideness and Wonder, Rubin writes a fascinating and engaging account of O’Keefe’s life, but also really gets across how many barriers she had to break in the art world by being a female and American -trained. What really blew me away though, was the design. As one would hope from a biography about an artist, it’s amply illustrated with her work. What I especially appreciated is that it was work from her entire career-- not just the flowers and animal bones. 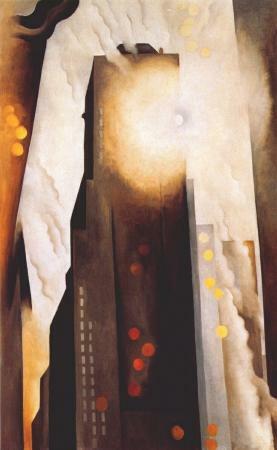 I never knew about her Art Deco-style work, which I absolutely adored. In addition to O’Keefe’s work, there are several photographs of her and the people in her life. Going beyond that though, and into the actual book design, every page is a different color---purple, yellow, blue and often has a subtle design in paler tones. It’s subtle enough that I didn’t find it at all distracting. A wonderful book about a fascinating person. Aren't the color pages beautiful?